The photo above was featured in today's The Gartman Letter, and is also featured here. Sweet Jesus, I weep for our future (are future). yeah, we our in deep trouble. Man, Michael J Fox's youngest sister from "Family Ties" has really let herself go. 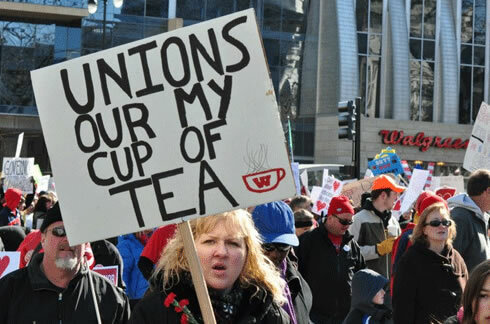 Lady, that sign better have been made in a union shop. Wonder if that picture will make its way into the NY Times or MSNBC? I wonder if that sign is a partial explanation for this. Maybe George Bush jr. inked that sign up. As I have read in a blog: "Our children are our future"...and that's why I'm building a bomb shelter in Marquette: the photo displayed provides proof positive! What side is that Walt? The sensible, rational union supporters? Perhaps she is a non-union worker hired by the union to save costs.